David Pimentel, an ecologist who spent all of his career at Cornell University after earning his doctorate in entomology in 1951, is one of the most respected environmental scientists of his generation. He was among the select group of young ecologists who in the 1960s first identified the environmental and public health hazards of farm chemicals, and helped build the scientific case for healthier, more environmentally-sensitive agriculture practices. The fact that organic crops are the fastest growing sector of the American food production system owes a considerable debt to Dr. Pimentel’s scholarship and advocacy. Dr. Pimentel also has spent almost 30 years, ever since he chaired a federal Energy Department advisory committee in 1979 that looked at the potential of plant-derived ethanol, as the nation’s most important opponent of turning the might of American agriculture to fuel our cars. Bruce Dale is a 57 -year-old chemical engineer who was born in Nevada, raised in Arizona, and is among the most decorated process scientists of his generation. After stints teaching at Colorado State University and Texas A&M, Dr. Dale joined the faculty of Michigan State University in 1996 to chair the chemical engineering department and prepare for the biofuels boom that he anticipated would emerge as petroleum prices rose to unmanageable levels. He is now the associate director of MSU’s Office of Bio-based Technolgy, helping to coordinate an interdisciplinary team of scientists and social theorists that span more than a dozen departments at the nation’s second largest university. He also is one of the five team leaders of the Great Lakes Bio-Engineering Research Center, a collaboration between MSU and the University of Wisconsin that earlier this year was awarded a $125 million, five-year grant from the Department of Energy to develop the scientific foundations for vastly expanding the American production and processing industry that is turning plants into transportation fuels. Over the last two years, almost unnoticed by the mainstream media but with increasing visibility in policy, industrial, capital, and scientific circles, Dr. Pimentel and Dr. Dale have been locked in a profound disagreement about the usefulness of producing fuel from plants. On the most basic human level, the strikingly different conclusions that these two eminent experts draw about the perils or promise of biofuels is the most personal high-profile scientific disagreement since the 1980s . During that era economist Julian Simon of the University of Maryland bet Stanford ecologist Paul Ehrlich that the prices of five key metals would either rise because of the trend to ever more scarce natural resources, as Dr. Ehrlich predicted, or fall because of innovation, as Dr. Simon said. In 1990, Dr. Ehrlich conceded defeat, an event that helped lay the intellectual foundation of the free market attack on American environmental laws as overly restrictive and pessimistic. The expert disagreement between Dr. Dale and Dr. Pimentel rivals the earlier dispute in substance and significance. Dr. Pimentel’s analysis has influenced public opinion and the media, including this blog, with a penetrating critique of the environmental safety and economic wisdom of committing to a fuel production sector based on crop science, agronomy, and new processing technology. Dr. Dales asserts, though, that the Pimentel analysis is flawed in its basic construction. Those flaws, he argues, are impeding the progress of a vital sector in the green economy that promises to be much more environmentally sensitive to soil, air, and water even as it builds a new regional farm production and processing economy that will benefit rural America, and the Middle West in particular. To hear Dr. Dale tell it, generating the production capacity to fill tanks with what he calls “grassoline” could be as essential to the Midwest’s new prosperity as the digital economy has been to the Pacific Rim states. At the core of the discord is an analysis of how much energy it takes to make a gallon of fuel from ethanol versus how much energy that same gallon produces. Technical folk call this the “net energy” balance. Dr. Pimentel asserts that producing ethanol from corn yields a negative net energy balance, meaning it takes more energy to make a gallon of ethanol from corn than the energy produced. His calculations gained credence because of the energy intensive practices involved in growing corn — lots of irrigation, farm chemicals, fertilizers, and fuel go into its production. Essentially, he argued, it takes as much energy to produce a gallon of ethanol as the energy that results. But more recently, Dr. Pimentel has made the same assertion about producing fuel from switchgrass and other crops that yield higher levels of biomass from which to produce ethanol, and can be grown with much fewer inputs. Producing ethanol from switchgrass, according to MSU plant scientists, involves planting the crop once, applying no farm chemicals, and much less fertilizer than is used to produce corn, and harvesting the crop once a year. Dr. Dale, meanwhile, argues that “net energy” critics are “dead wrong and dangerously misleading.” Here’s why, he says. Producing a mega jule (MJ) of gasoline, a unit of energy measure, requires 1.1 MJ of petroleum, 0.03 MJ of natural gas, and 0.05 MJ of coal. The total fossil fuel input is 1.18 MJ per 1 MJ of gasoline or a – 18 percent net energy balance. Producing a MJ of ethanol, meanwhile, takes 0.04 MJ of petroleum, 0.28 MJ of natural gas, and 0.41 MU of coal, for a total fossil fuel input of 0.73 MJ. Thus producing ethanol, says Dr. Dale, yields a +.27 percent net energy balance, considerably better than gasoline. 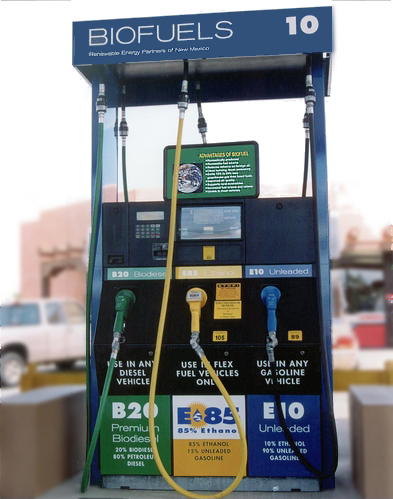 Corn ethanol also produces 18 percent less global warming gases than gasoline, says Dr. Dale. Ethanol made from switchgrass produces 88 percent less global warming gases, and its use would displace petroleum as a fuel source, reducing reliance on imported oil and all of the useful results that would confer on the nation. Settling this rupture is not about who’s right, but who’s wrong. If Dr. Dale is wrong, then pursuing the biofuels future he advocates would be irresponsibly expensive to taxpayers, cause enormous environmental damage, and do nothing to loosen the noose that rising oil prices and diminishing supply has wrapped around the nation’s neck. If Dr. Pimentel is wrong then a promising green economy that reduces environmental damage, shores up the Midwest’s flagging farm economy, curtails America’s dependence on imported petroleum, and fosters a new community-based green fuel production and distribution system could be seriously weakened by a public backlash predicated on faulty data. No doubt, I’ll be reporting more on this as we go along. Thank you for the brain wake-up. Good stuff. There is another paper, located here and briefly summarized here that provides additional context for this issue. I am trained in ecology and Pimintel is about as big a name as you can get in the field. His name goes a long way. My view is that the small farmer has been ruined by industrial agriculture, and provided we can keep the big boys at bay, this is a good opportunity to get some folks back on the farm. Also, natural systems are powered by the sun and plants, so this is a sensible path to go down as we learn how to function as societies with less energy. An aside, I’ve met Ehrlich (my grad advisor was postdoc in his lab) and there’s more to The Bet than he lost; Paul admitted afterward he was foolish to take the bet, and re-wagered Simon on more representative non-substitutable carbon/carbohydrate/natural systems-based indicators. Simon refused. Good read Keith. I look forwarding to hearing more about this debate. Never quite sure how to respond to probing questions about the wisdeom of a wholesale rush to Midwest ethanol. The weight of the evidence that I trust, including expertise at WorldWatch, the NRDC. and the Institute for Local Self Reliance clearly trends against David Pimentel’s thesis, and the numbers he uses to make the case that the energy balance makes ethanol-based fuel impractical. His strongest case, involving corn, is pretty solid according to independent authorities, though even there making ethanol from corn generates 40 percent more energy than it takes to produce. His weakest case, according to authorities, is in cellulosic ethanol manufacture. On the Ehrlich bet, interesting that one event so considerably shaped his career and reputation. Of such instances does a life make. It also reflects the power and influence of the pen to shape perception, in this case NY Times writer John Tierney’s, who reported the bet and its significance in the early 1990s at the height of the criticism leveled at the environmental community about its chicken little credibility. A small food company that I have an interest in, and chair, had a board meeting last week. Looks like we’ll have to increase the prices paid to farmers is going up about 70% for the ’08 crop. Despite great strides in our processing efficiency and cost controls, I expect we’ll have to raise our prices to our customers. In large part, it’s competition from corn. Wheat prices just hit record highs. I expect many food prices to rise soon. I hope alternatives to corn are developed. Even if ethanol has a 27% net energy gain, what about that 63%? As Cutler Cleveland pointed out, even if ethanol gives that kind of net energy, it means that 2/3 of our economy is people making biofuel so the other third of the economy can function. Besides which, if all our corn crop was turned into ethanol (leaving none to eat) it would cover about 8% of our fuel needs. There’s just not enough land or nutrient stream or water to fill all the gas tanks, switchgrass, algae, or whatever. The answer lies in abandoning the 4,000 pound steel box on wheels as a vehicle and restructuring our living arrangements so that we can walk to work and shop. It will happen eventually whether we like it or not. Our only decision is when and how we ditch the automobile. Hi there! Someone in my Facebook group shared this site with us so I came to look it over. I’m definitely enjoying the information. I’m book-marking and will be tweeting this to my followers! Fantastic blog and great design and style.